If you are looking for creative ways to use your foil sheets, then today’s project, featuring a subtle, mottled foil technique, is just for you. Hello, Terri here. Get the hand wipes ready because we are going to get sticky, inky and sparkly! If you’re not sure what mottled means, it’s defined as spotted, speckled, flecks, marbled, streaky, blotchy, etc. I wanted a way to add foil to my card background but have a more subtle effect. My vision was to have speckles and a stringy effect. As you can see in the photo below, I did just that! Now, in my research, I couldn’t find anything quite like this, using the technique that I had in mind. To achieve this, I crumpled my Adhesive Sheets 4×6 inch and blotted it in a random pattern on my background. Next, I crumpled my gold foil sheet, from the 3D Creative Foam Embellishment Kit, laying it on top of my background and rubbing all over. Quickly rip the foil lining off your project and behold! If you wish to get a more stringy, mottled effect, gently rub your finger across some of the adhesive areas to create a more stringy appearance, then foil. I love this effect so much and I know you will too. 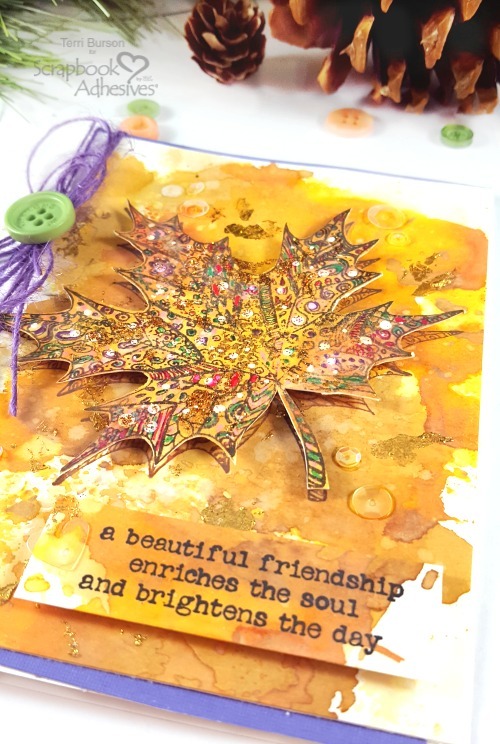 It’s such a quick and easy technique and adds a wonderful mixed media element to your projects. Be sure and watch my video below to see the process in action. 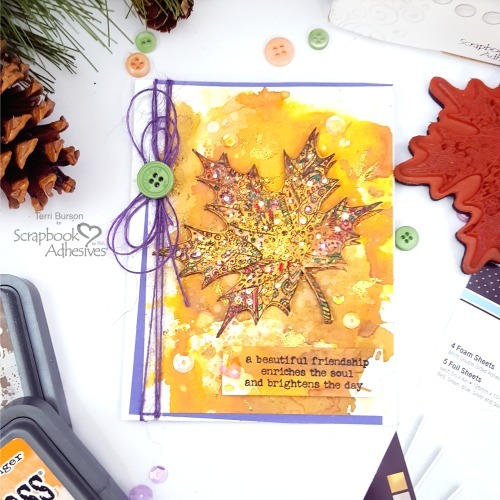 As you will see in the video, I created two mottled foiled backgrounds and stamped this leaf image onto one of them. I fussy cut the leaf, then propped it up onto my background using my Crafty Foam Tape White and also, for my propped up sentiment. These photos can’t quite capture the beautiful foil effect on the leaf. Trust me, it’s gorgeous! A few additional items help to finish off this project, including the Adhesive Dots Medium to secure my string and button. Lastly, the clear glue from my Dual Tip Glue Pen is a staple in many of my projects. It’s my go-to glue for adhering sequins. I love it! I hope you will give this fun, mottled foil technique a try, and Wear Your Adhesive On The Outside! Thanks so much for stopping in and enjoy the video! You’ll find a full list of products in the video description, as well as on my blog at Waving My Wand. This entry was posted in Adhesive Dots & Lines, Adhesive Sheets, Adhesives, Cards, Crafts & Tutorials, Crafty Foam Tape, E-Z Runner® Dispensers, Embellishments, Intermediate, Metallic Transfer Foil, Mixed Media, Other Adhesives, Permanent Adhesive, Skill Level, Tutorial, Wear your Adhesive on the Outside and tagged 3D Foam Creative Embellishment Kit with Foil, Adhesive Dots Medium, Adhesive Sheets 4x6", Adhesive Sheets 6x12", Card, Card Making, Craft Foil, Crafty Foam Tape White, Dual Tip Glue Pen, E-Z Runner Permanent Strips, E-Z Runner Permanent Strips Refill, E-Z Runner Permanent Strips Refillable, E-Z Runner Permanent Strips Refillable Value Pack, Foil, HomeHobby by 3L, Metallic Transfer Foil Holographic, Metallic Transfer Foil Variety, Terri Burson, Video Tutorial, Wear Your Adhesive on the Outside. Bookmark the permalink. 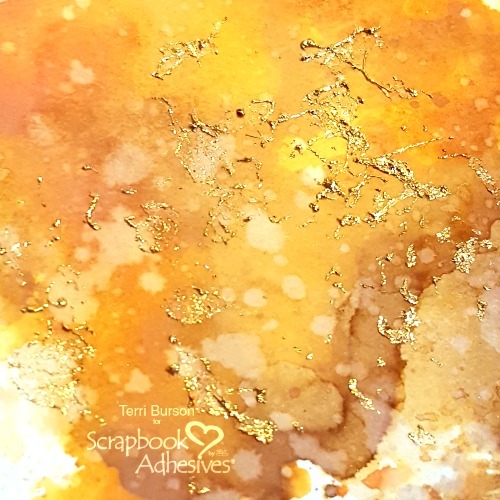 2 Responses to "Mottled Foil Technique For Papercrafting"
This is really beautiful. Teri. This technique would be great for some coffee themed cards. Becca, you are so right! Thanks so much for stopping in!